Eklavvya is complete automation and administration of your Examination/ Assessment Process which provide question bank management, less paperwork, exam result processing, payment management, trusted by many, scalable, no upfront investment, knowledge management. The Vision of SplashGain Technology Solutions is to be a globally renowned provider of innovative IT products and solutions that effectively assist students and institutes thus adding value and simplifying education processes. Our Mission is to be amongst the top 10 IT products and services company worldwide in the education vertical , while being present effectively in the education life-cycle of a student from Playgroup to Post-Graduation (PG to PG). Entire Assessment Process can be completed in paperless manner. Share documents, articles with registered users. System can accept online Payments for registration of exam from applicants. Eklavvya.in is trusted by many universities, institutes, schools and colleges. Hosted in Scalable Cloud Environment. Q. Can this application be integrated with ERP Solution ? It is possible to integrate Online Examination System Eklavvya.in with your existing ERP Solution. We provide Application Programming Interface (API) to be consumed by your ERP solution. Q. Can we conduct Test Series of the Candidates ? Eklavvya platform can help us to define multiple online exams of varying difficulty level based on topic/ chapter/ subject/ skill set etc. You can define multiple set of exams based on various patterns. Q. 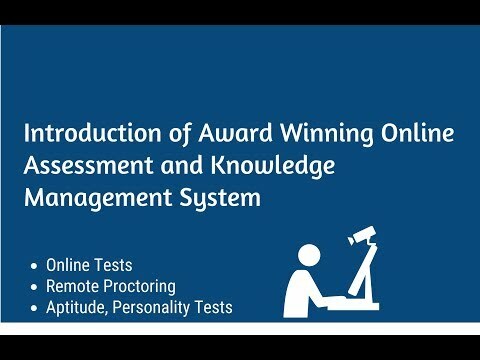 Can I host Online Exam Application on some other server ? Yes, it is possible to host online exam application on other server. Eklavya platform has been hosted on many private/ cloud servers as per need of the organization or education entity.